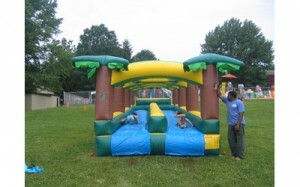 Step through the riverboat around the alligator’s mouth, under the anaconda and down the slide on our 30 foot water obstacle course. 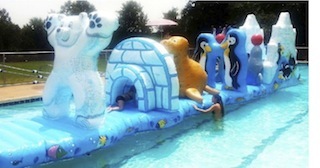 Squeeze under the polar bear’s legs, crawl thru the igloo, make your way around the walrus and slide down the glacier into your pool on in our brand new 40 foot long water obstacle course. 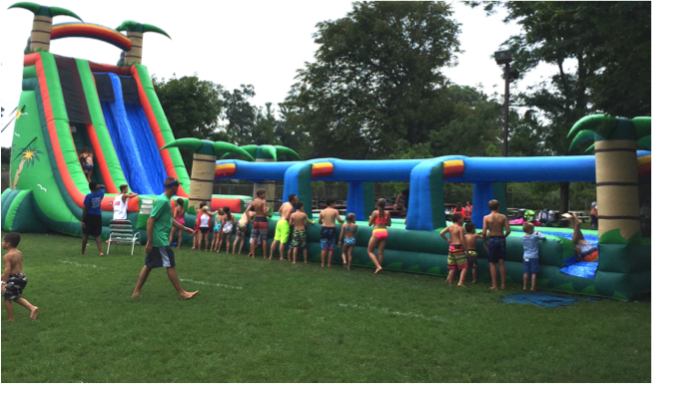 Play the ultimate water balloon battle! 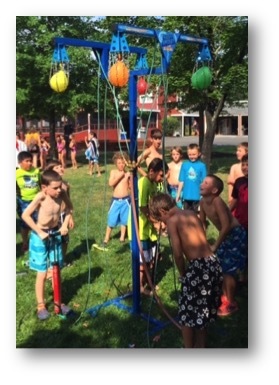 Opponents go to opposing battle stations with buckets of water balloons. Each battle station has a water balloon launcher. 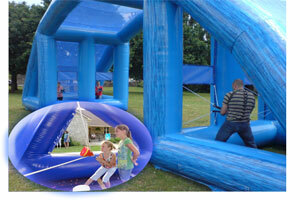 Place a balloon in the launcher, pull down on the handle, aim, and fire! 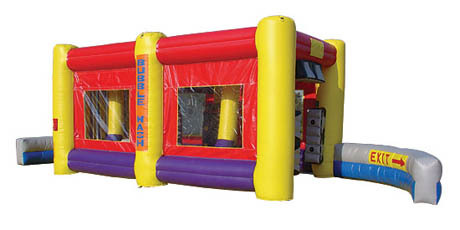 Your balloon soars through the air and comes crashing down on your opponent’s battle station. 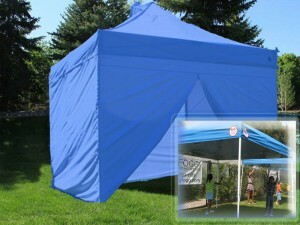 There are strategically placed slots and holes in the structure that allows the water to come through. You might get sprinkled, sprayed, or saturated, but watch out, retaliation comes quickly….! Put your suntan lotion on and GO! 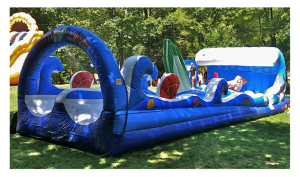 Make your way past the surfer over the sandcastle through the lifeguard stand, around the beach balls and down the slide on our 30 foot long water obstacle course. Race under the ring master’s legs, through the lion’s hoop, under the clown car, around the elephant and make your way over to the circus tent slide into the pool on this 40 foot obstacle course. A light mist is dispersed into the air by this high powered fan, otherwise known as the outdoor air conditioner. The mist fan can lower temperatures to 35 degrees, ensuring that blistering outdoor environment can be transformed into a comfortable and pleasant experience. Get wet & clean as you make your way thru the scrubbers. 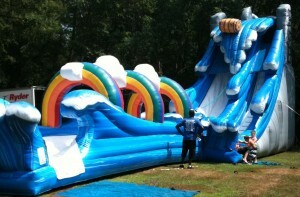 You will also get cooled off by the streams of air coming out of the sides. 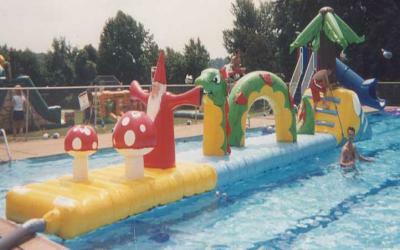 Begin this 25 long obstacle by hopping over the octopus, continuing passed the captain and sliding down the end of the submarine into the pool. 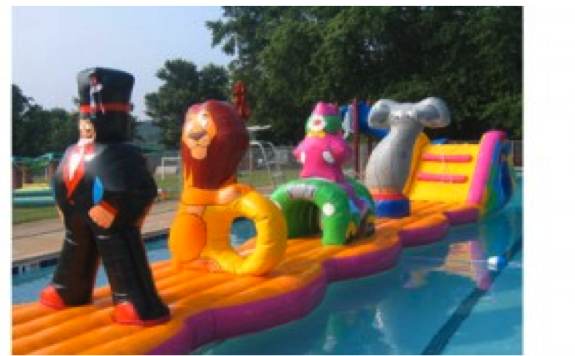 Grab your ticket and enter this 40’L carnival themed pool inflatable! Zoom down this 15 long slide and splash into the water. A hose should be present to keep the slide wet and slippery at all times. 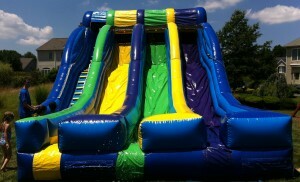 Soak ’em good in our 400 gallon dunk tank filled with water. 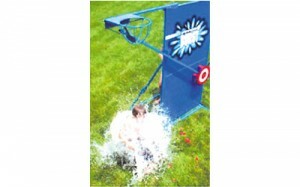 Participant throws a ball and hits target, the seat is released and volunteer falls into tank. 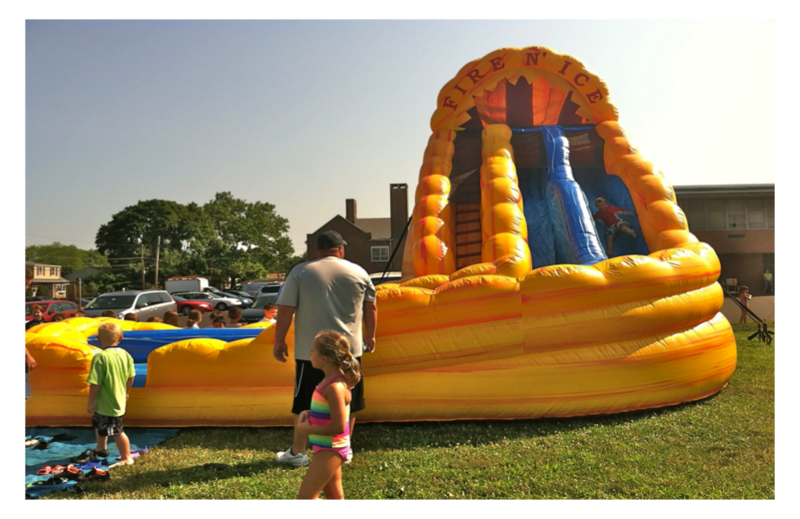 Client must provide volunteers to sit on dunk tank. 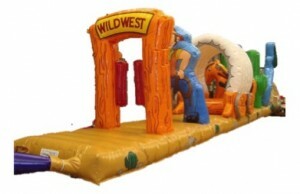 Strike it rich on this 50 foot long inflatable gold mine. 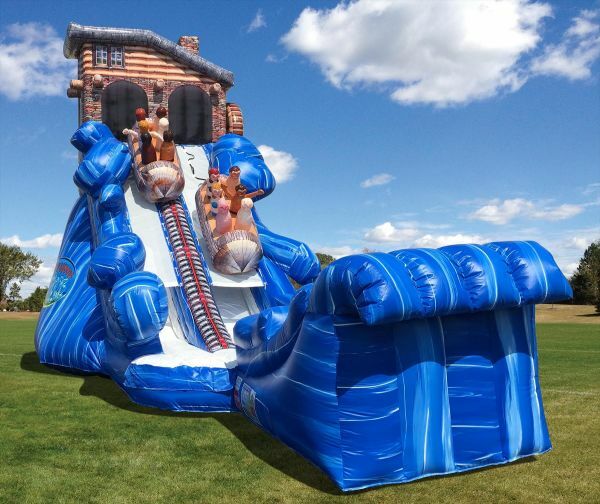 Balance yourself around the mine wagon, between the barrels, over the log pile and slip down the slide at the end into the pool. Description: Lights, camera, PLUNGE! 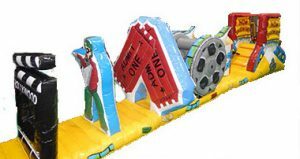 In this Hollywood themed obstacle course, you must jump and duck to make it to the end of the course without plunging into the pool below. Pump fastest to stay dry and burst the balloon onto your opponents. If you don’t pump fast enough, you will get soaked! Small children can safely steer themselves around in these battery-charged boats. 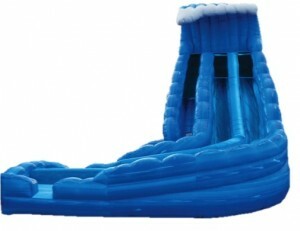 This boat is easliy maneuvered, extremely stable, noise free and powered by one encased battery. One child per boat. Up to six boats can be rented at one time. Description: Jump onto King Tut’s Tomb and make your way over the great pyramid through the trees and slide off the Sphinx at the end into the pool on this 25 foot long obstacle course. 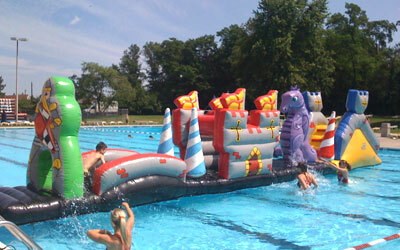 Slip past the knight, over the drawbridge, through the castle, around the dragon and then down the slide into the pool on this 40 foot medieval adventure. 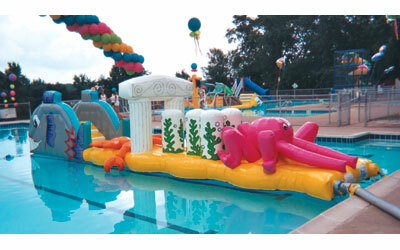 Add a waterfall to your pool with this high powered pump. Water shoots into the air spraying everyone in its path. 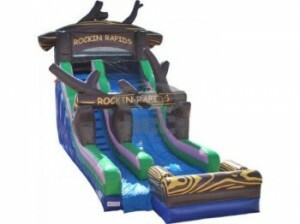 Make your way past the caveman, around the dinosaurs and under the pterodactyl to get to the volcanic slide on this 40 foot water obstacle course for the pool. Step over the octopus, make your way through the archway, dodge the crab and slip off the slide of this 30 foot water obstacle course. 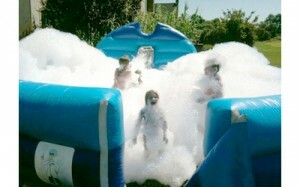 Silly Shower provides all the fun of a dunk tank, with None of the Water Issues! The water is treated and recirculated so that there is no leakage and the Silly Shower rental can be used indoors and outdoors. 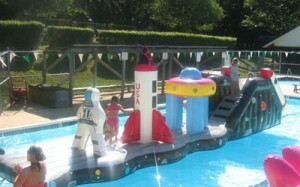 Make your way around the astronaut, over the rocket ship and through the spaceship. Slide down the space shuttle on this 30 foot long water space adventure. 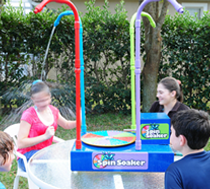 Spin the wheel, pull the handle and someone-you never know who-gets soaked. One by one players get wet-the one who stays the driest longest wins. 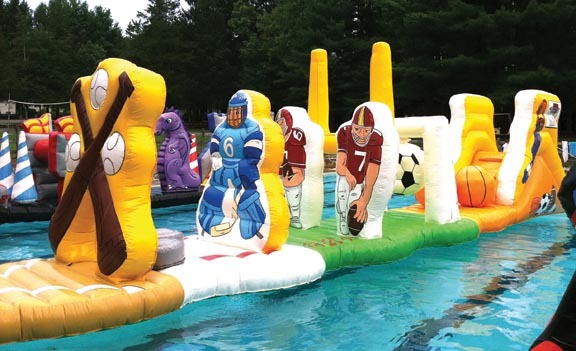 Make your way under the giant baseball bats, balance yourself around the hockey goalie, charge past the linebackers, duck through the soccer goal and then slip down the slide on this 40 foot long sports themed obstacle course for the pool. 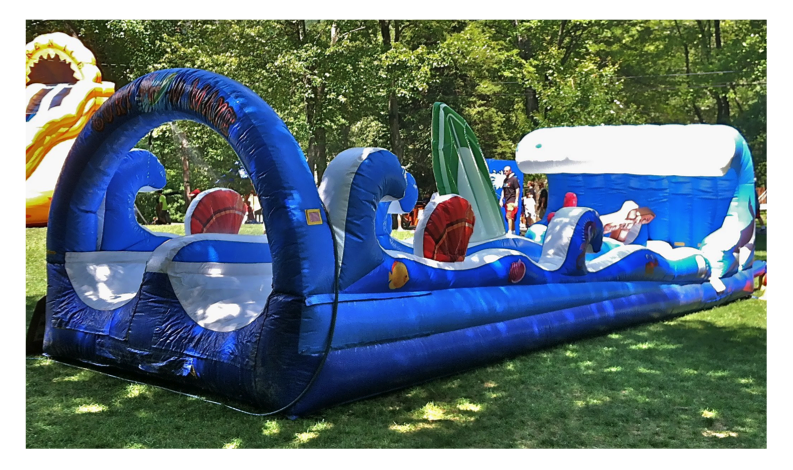 The Amazing new Water Dodge ball has arrived! 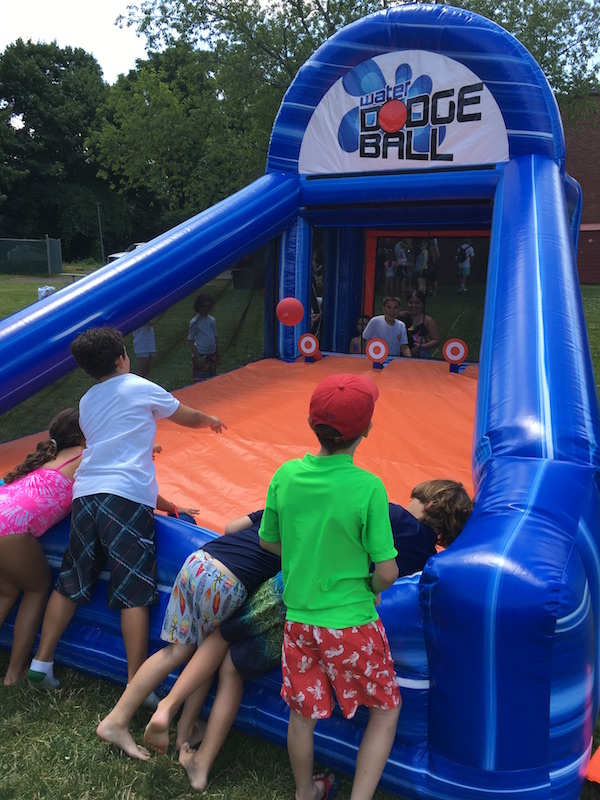 The object of the game is to throw your ball at any of the 3 Water Dodge Ball targets. Once a target is hit it releases a blast of water that the “Splash Victim” in the splash zone has to try and avoid. This game generates tons of excitement for all involved. 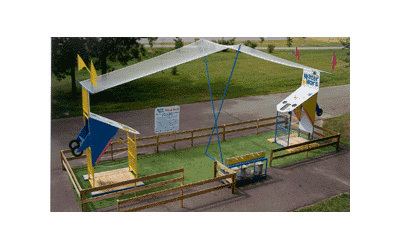 Up to six children at a time step into this obstacle maze and blast away with our high powered waterguns. 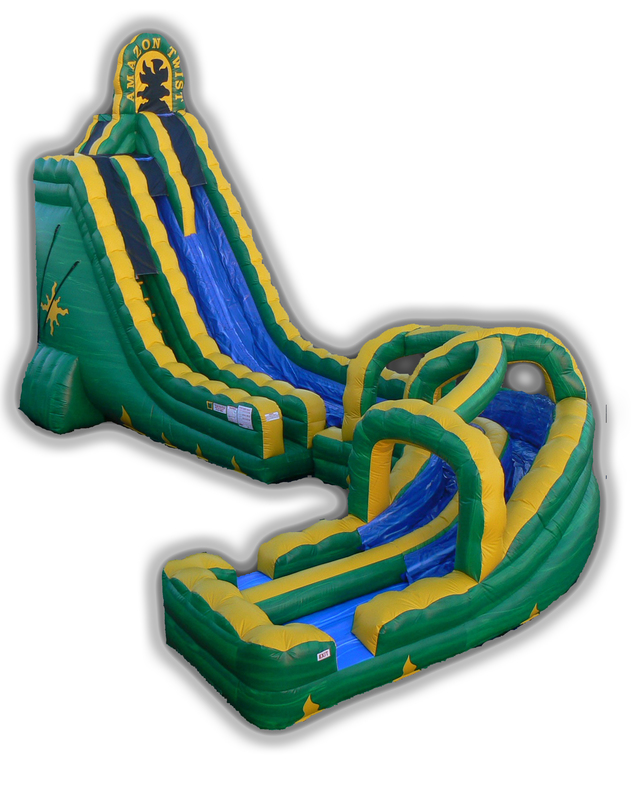 Duck and hide behind the obstacles while blasting water to soak your opponents. 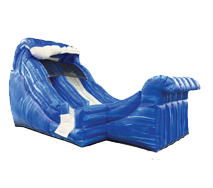 This slip and slide version is now able to fit in the pool. A 35 long floating walkway will test your sense of balance and agility. Can you make it all the way across without falling off? Step inside your battle station and prepare to wage war with water balloons! 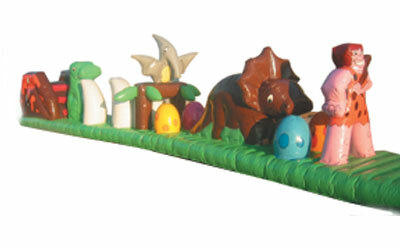 Take aim with your slingshot and launch your balloon, soaking your opponent. (fencing and turf not included). Kick off your boots, slip on your swimsuit and enter through the saloon doors of this 30’western adventure. Try not to fall off! 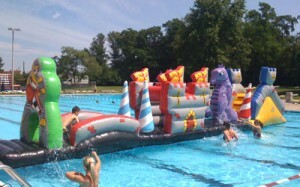 Help the wizard defeat the dragon before sliding off this 40 foot mystical wobble course designed for swimming pool fun!